This morning I stumbled upon this photograph while I was looking for some older work. I photographed this after seeing Monologue from Jeff Wall. I liked the idea of the stage with the streetlamp and the lit window in the background and the darkness, which is not often seen in his photographs. 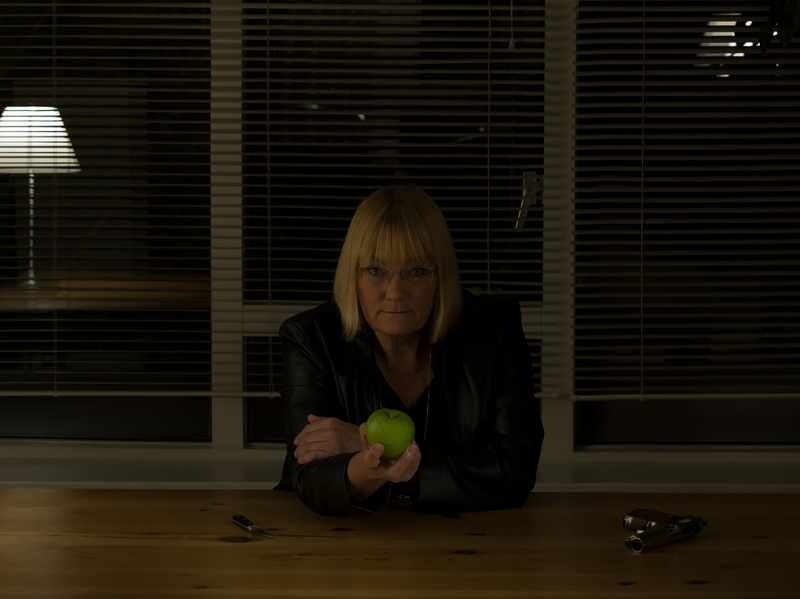 In my photograph the monologue is that of the stepmother offering the poisened apple to Snow White. She does not even have to say anything. The viewing of the fresh apple is enough to want it, in this setting. Just how companies are making us want their crap (stuff, experiences). Threatening us with FOMO or being “less” than our neighbour. Probably I did not show it to you before because it’s a classic example of me trying to say too many things with one image, thereby confusing the viewer. The gun is emphasizing the dangerous side of the otherwise innocent knife. Not only can it be used to peel the apple it can also be used to threaten. And why the apple showing in a setting reminding of a photograph of Jeff Wall? This subject matter is completely absent in Jeff’s photograph. And what helps the viewer understand the apple stands for the cars, watches, shoes, vacations we are all longing for here? What was I thinking, right? Still, I like this image, or it would not have been on my mind hours after I encountered it this morning. What are your thoughts?